This was a practice that to an external observer (me) involved watching the same horse race over and over again until you had gleaned every last piece of information possible from it and had ‘rated’ (or scored) each horse in that race. After that, the race itself would be rated, and so would many other details that they had been trained to look for. This bespoke system they had developed of rating horses, races, conditions and riders all contributed to their knowledge about how the horse would perform over time. What they had observed over years, was that a horse would improve incrementally for a period but was also capable of ‘jumping’ very quickly up a few levels in performance and it was this jump that they carefully watched for in their rating statistics. It was their ability to be ready for improvement that gave them a competitive edge. Like horses, us humans, can sometimes give the impression of making an improvement very quickly the quintessential “overnight success.” Improvement requires practice and it’s never quite clear when we’re learning something new, when we’re going to improve or whether that breakthrough will happen at all. The constant practice and search for improvement can be a bit daunting and demoralising at times. This week, I was lucky enough to be present for one such improvement breakthrough moment. One of the users we’ve been working with on a project appeared in the doorway of the cupboard/ workroom that we’ve tucked ourselves away in. “I’m so happy, I have to share!” He was beaming from ear to ear. He went on to explain his breakthrough. He has been on the project team since the beginning and has been an active participant the whole way, but it has been difficult terrain. His commitment has never wavered, but we can tell that he’s struggled with the way the new system works, there have been a lot of confused looks and ‘why are we doing this?’ moments over the last few months. His breakthrough was the result of persistence and practice. He reminded me of the importance of practice, and the absolute necessity of training for the job that people will do with their team. It’s a much more exploratory to learn but it pays off in these moments when someone gets the reward of their own efforts. We’ve spoken before about what it takes to deliver training in a project. 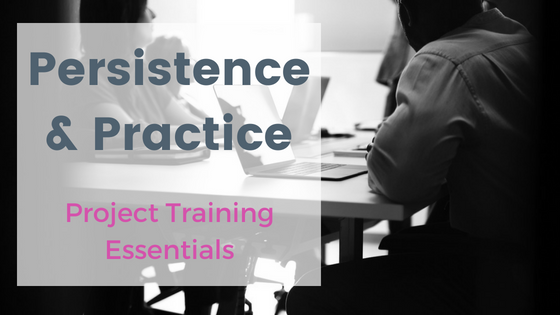 Over the many projects that we’ve worked on, and people that we’ve worked with, we learn more about how to better deliver training. This breakthrough highlighted to me, the importance of persistence and practice. In this situation, we had also used the technique of having a ‘training buddy’ someone to work things out with, a fellow explorer in the new system. This mirrors a development practice in agile process, where two developers work together at the one screen. Buddy up – two heads have more observation power than one! If you are struggling with the best way to train on a new system, get in touch. We buddy up with retailers to equip internal teams for the project efforts ahead. Our project management tools are light and flexible for retailers. The 6R team work behind the scenes, leading through project management, testing, training and team building to deliver project success.